On Friday, March 20, Private Client & Institutional Services (PCIS) of Associated Bank in Chicago, volunteered at the Feed My Starving Children (FMSC) organization to pack food for starving children for the country of Burkina Faso in Africa. FMSC is a non-profit organization committed to feeding hungry children. They have worked to develop a food mixture that would be easy and safe to transport, simple to make with only boiling water, and culturally acceptable worldwide. The formula is designed to meet the needs of severely malnourished children. PCIS provides highly personal service and complete financial solutions to successful business owners, executives, their businesses and their families. 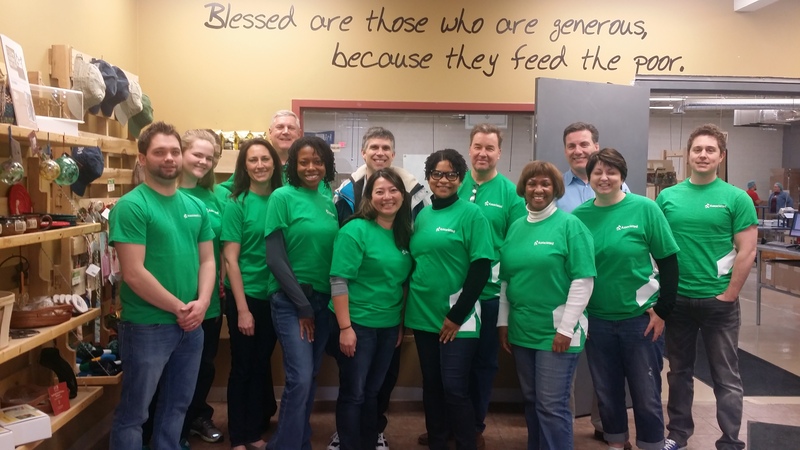 Associated Bank PCIS colleagues recently sought out FMSC and extended their hands in service. Together, they packaged 864 packets of food in just two hours. Each packet feeds one child for a day and costs only 22 cents to produce. Associated volunteers were designated tasks such as measuring out rice, soy protein, dried vegetables and vitamin powder, filing and weighing the packets, sealing the packets, refilling containers and ensuring quality control. They filled a total of 24 boxes with the packets and carried them to different areas in the storage facility when ready. With the work of volunteers, FMSC has been able to provide food for nearly 70 countries around the world.